My Dad was conscripted or joined the Royal Navy (Fleet Air Arm) on the 27th March 1944, reporting to H.M.S. Gosling at Risley, Near Warrington, Cheshire, which was an F.A.A. Training School, as a Naval Airman/Mechanic. At that time, he was 17 years old, although the Royal Navy have his date of birth as one year older than he actually was. From the picture below, which was taken of the class at H.M.S. Gosling, they all appear to be quite young and probably wishing they were elsewhere?. After 10 weeks training, Dad left H.M.S. Gosling on the 9th June 1944. Course photo at H.M.S. Gosling (March 1944 - June 1944) Dad is front row, 4th left to right. Dad reported to H.M.S. Vulture, RNAS. St. Merryn, Cornwall, on the 10th June 1944, the first of many Royal Navy Air Stations he was to be stationed at. 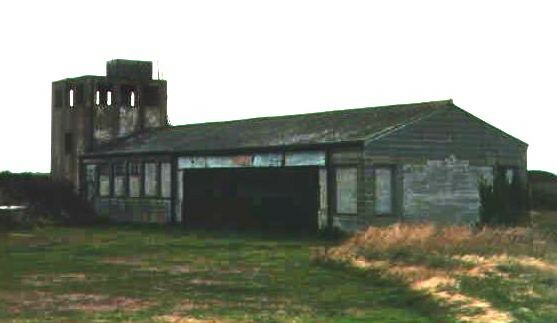 The Air Station still survives today, but is in a run down and derelict condition in the main, although part of it is used by a Parachute Club. The disused Control Tower, Hangar's, Accomodation Blocks and Cinema are still standing and the CO.'s Quarter's is now a Farmhouse. Most of the site is owned by Treginnger Farm. Dad remained at H.M.S. Vulture for 6 months, leaving on the 6th January 1945. Crest of H.M.S. Gannet - 'Victory is my Solace' . . . . . . . . . . . . . . . . . . . . . . . . . . . . . . . . . . . . . The next Royal Naval Air Station, was at H.M.S. Gannet, RNAS Eglinton, Co. Londonderry, Northern Ireland, probably, the first time Dad had ever left the mainland, arriving on the 7th January 1945. This is when he first joined No.1850 Squadron and was to remain with that Squadron, until it was disbanded in August 1946. Not much of the original Air Station remains today, apart from the lengthened runways, which now forms Londonderry City Airport. Dad was only at H.M.S. Gannet for a month, before the Squadron transferred to an Aircraft Carrier, leaving on the 8th February 1945. The first Aircraft Carrier, was a Colossus Class Light Fleet Carrier, H.M.S. Venerable (R04), which picked up the Squadron off the Bangor Coast in Northern Ireland and sailed back to the Clyde, on the 9th February 1945. The Squadron practised Accelerator Take Off's (ATO's) and Deck Landing Trials (DLT's) on H.M.S. Venerable for about 2 weeks, until the 25th February 1945. On the 26th February 1945, the Squadron and Dad joined H.M.S. Vengeance (R71), another Colossus Class Carrier, the sister ship of H.M.S. Venerable, this was to be their 'home base' for the next 18 months, apart from the other Squadron bases ashore, in the Mediterranean, Asia and Oceania, after sailing from Greenock on the 12th March 1945. The ship finally returned home to England on the 12th August 1946, having seen two War's end, the European War and the Pacific War. This signalled the end of the First Commission of H.M.S. Vengeance and the disbandment of No.1850 Squadron. Dad then reported to H.M.S. Daedalus at Lee-on-Solent, Hampshire on the 13th August 1946, another Royal Navy Air Station. He remained there for approximately 4 months, until being drafted to another base, leaving on the 10th December 1946. The next base, was H.M.S. Fulmar, in Lossiemouth, Scotland arriving on the 11th December 1946. This was probably Dad's worst drafting of his Service, although he never talked very much about the War, or his Naval Service, I do remember him telling me, "It was the coldest place, I have ever been". This must have been some contrast after being in the Far East and Meditteranean for so long, and then to the far North of Scotland. Either way, he remained at the Royal Navy Air Station for five months, before being drafted again, leaving on the 31st May 1947. The final base of Dad's Naval Service, saw him back at H.M.S. Daedalus at Lee-on-Solent, Hampshire arriving on the 1st June 1947. Whether he was ever asked to remain in the Royal Navy for another period of time, I do not know, however, he left the Royal Navy on the 30th July 1947. For Dad's Service in the Royal Navy, he was awarded three Medals, the 1939-1945 Star, the Burma Star with Pacific Clasp and the War Medal 1939-1945. I wrote to the Royal Navy Medal Office after reading an article in 'Navy News', regarding the "Atlantic Star", in which the criteria for obtaining this Medal had been revised *. After a few months, I was sent the Atlantic Star Medal with a 'Revised Medal Entitlement Card' for my Dad. Unfortunately, he never saw it, as he died in 1995 after a long illness. * See 'Drop own and Go News Headlines' on Home Page or Site Map for more information, on the Atlantic Star Medal. I have for the last few years, attempted to research my Dad's Service in the Royal Navy, my biggest regret, is that I didn't enquire enough, with Dad himself, before he died. He would have given me most of the answers I now seek, particulary with the names of his "oppo's" in the attached photo's and where they came from, these answers, I shall probably never know, unless you can help!. Through the various and numerous Associations, I have managed to contact 45 former members from H.M.S. Vengeance (1944-1946) all of whom responded to my letter, 15 from No.1850 Squadron (1944-1946) regrettably, not all the Squadron's former members, wished to be involved and 4 from No.812 Squadron (1944-1946). However, I remain in contact with quite a few, who have helped me to piece together, the dates and places H.M.S. Vengeance, No.1850 and No.812 Squadron's were during the specific times and provided photographs, maps and items of interest, regarding the Ship and Squadron's. 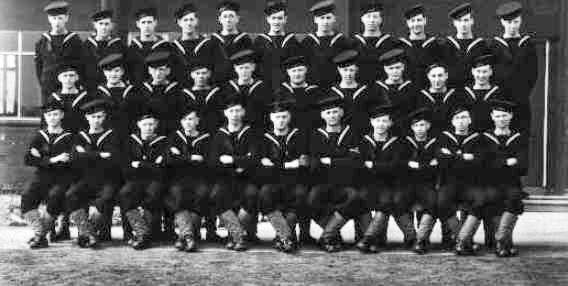 I would also like to try and contact any of Dad's former "oppo's" from H.M.S. Gosling, Vulture, Gannet, Venerable, Fulmar and Daedalus or any Naval Airman/Mechanics, and other Fleet Air Arm branches, who may have known him. I also obtained help from the various Naval and Air Museum's, both home and abroad, who provided details of ship and aircraft specifications, these have been a very useful source of information and I am indebted to them all, for the items they provided. Finally, two books have been published, both written by former Aircrew from No.1850 Squadron and No.812 Squadron. The first, "Naught for your Comfort" by Richard Phillips (ISBN 0-9532289-0-8) Corsair IV Publication 1997., who was the Senior Pilot with No.1850 Squadron. The second, "Carrier Observer" by Gordon Wallace (ISBN 1-85310-307-1) Airlife Publishing Ltd 1993., who was an Observer in No.812 Squadron. Both authors tell their own stories of the Fleet Air Arm and of the Squadron's in which they served.